Thank you for selecting a WeatherBeater® Floor Liner from Winfield Consumer Products. 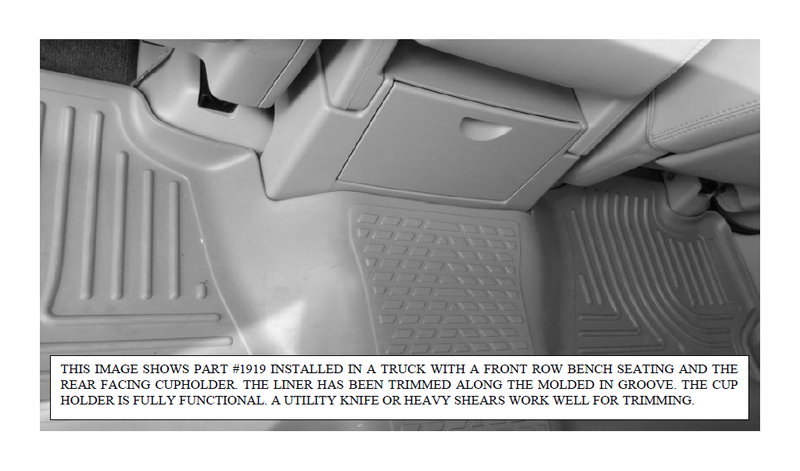 Your new rear floor liner is custom molded to fit your Chevrolet Silverado/GMC Sierra Extended Cab truck. The liner is made to take the place of your factory floor mats. 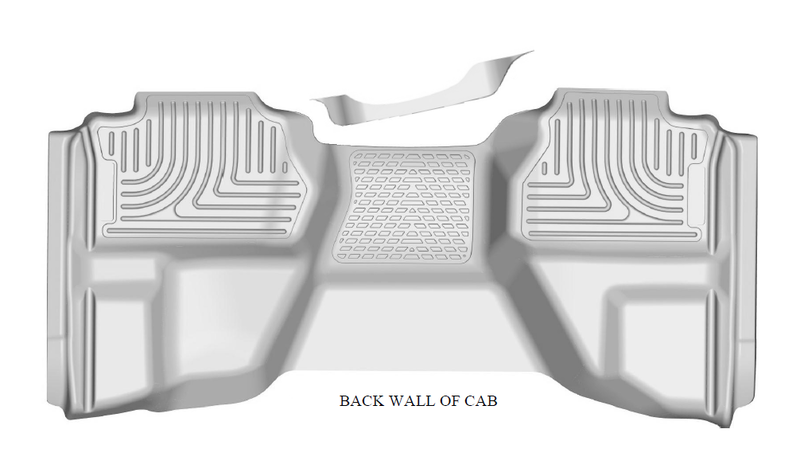 For correct fit, it is necessary to remove the factory floor mats before installing your new floor liners. However, do not remove the factory-installed carpeting. Your liner is made from an engineering resin that is lightweight and extremely tough and durable. The easiest way to clean your liner is with a damp cloth or sponge. If using a cleaner, 409® or Glass Plus® work well. Use of Armor All®, Son-of-a-Gun® or similar items is discouraged as these products make the liner slick. TO EASE INSTALLATION OF YOUR EXTENDED CAB 2ND SECOND SEAT LINER, MOVE BOTH FRONT ROW SEATS TO THEIR MOST FORWARD POSITION AND FLIP UP THE 2ND ROW SEAT BOTTOMS. WITH THIS DONE, INSTALL YOUR LINER, POSITIONING IT AS SHOWN IN THE IMAGE ABOVE. ONCE THE LINER IS INSTALLED, REPOSITION THE FRONT SEATS AS DESIRED AND LOWER YOUR 2ND ROW SEATS. 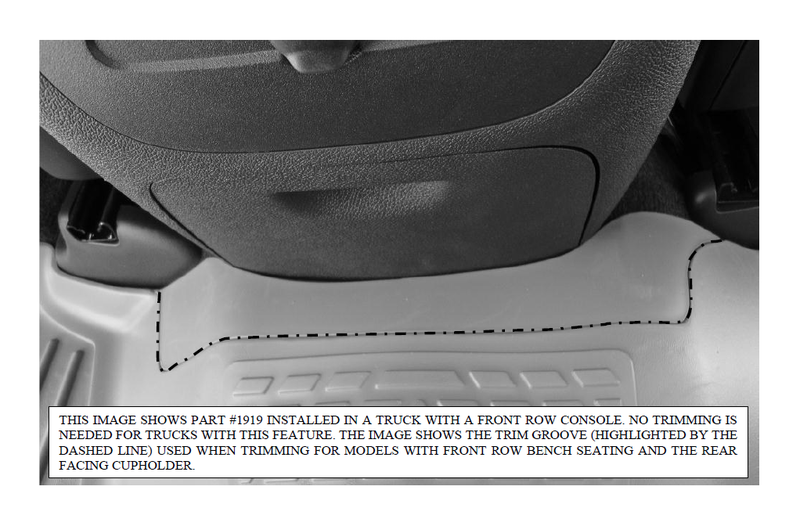 IF YOUR TRUCK HAS A CUP HOLDER ON THE BACK OF THE FRONT SEAT LOCATED ALONG THE TRANSMISSION TUNNEL, YOU WILL NEED TO TRIM YOUR LINER TO ACHIEVE THE CORRECT FIT. PLEASE SEE THE TRIMMING INSTRUCTIONS ON THE BACK OF THIS PAGE. HUSKY LINER GEARBOX™ PART #09011 CAN BE MOUNTED TOP OF THIS LINER. TRIMMING INSTRUCTIONS FOR PART #1919 IN APPLICATIONS WITH FRONT ROW BENCH SEATS AND A REAR FACING CUPHOLDER.